Police have arrested eight Spaniards accused of fighting alongside pro-Russian rebels in eastern Ukraine. The suspects were detained in raids in six regions across Spain, the interior ministry said, describing the operation as the first of its kind in Europe. They face charges of complicity in murder, possession of weapons and violating Spain's neutrality in the conflict. Rebels have been fighting government forces in eastern Ukraine since April. The eight Spanish fighters were arrested after returning recently from Ukraine where they took part in the conflict in the Donbas region last year, the interior ministry said. During their stay, the suspects posted pictures of themselves on social media with assault rifles and explosives. "This is the first police operation conducted in Europe against the activities of foreign fighters in the Ukrainian conflict," the ministry said. Media reports said the men had been inspired by the International Brigades, the multinational volunteer forces that fought against Francisco Franco's uprising during the Spanish Civil War. They had posted messages online about their commitment to fighting in Ukraine, vowing to fight fascism. Spain's El Pais newspaper said the suspects belonged to different communist groups and had received support from an unofficial pro-Russia network in Europe. Two Spanish leftists, Angel Davilla-Rivas and Rafa Munoz Perez, spoke to the media last year about fighting for the pro-Russian rebels. They said it was in recognition of the Soviet Union's support for the Republican side in the Spanish Civil War. Spain's interior ministry has not named the suspects arrested on Friday. Image caption The operation in Spain is said to be the first against foreign fighters in Ukraine. 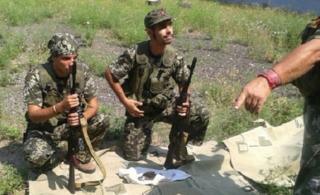 Forces on both sides of the conflict in Ukraine are said to have attracted foreign fighters. Swedish neo-Nazis were last year reported to have been fighting with the Azov Battalion, a pro-government volunteer armed group. The Ukrainian government, Western leaders and Nato say there is clear evidence that Russia is helping the rebels with heavy weapons and soldiers. Independent experts echo that accusation while Moscow denies it, insisting that any Russians serving with the rebels are "volunteers". Fighting began in Ukraine's eastern Donetsk and Luhansk regions - known as Donbas - last April, a month after Russia annexed the Crimea peninsula. Almost 5,800 people have died since then, the UN has estimated, although it believes the real figure could be considerably higher. The two sides say they are now withdrawing their heavy weapons from the front line under a truce deal.